Well, another year… another seminar! 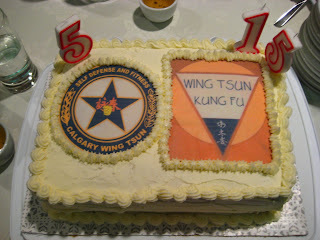 This year is a bit more special though, as 2009 marks the 5th anniversary of Calgary Wingtsun, as well as the 15th anniversary of Wing Tsun Kung Fu Vancouver. Huh?! These are WT concepts? Well, sure… in my own words! It’s one thing to be able to “eat up space”, but it’s another thing to become comfortable about being extremely close to your opponent. Being comfortable about suffocating the opponent, but not feeling the same yourself. It’s like being in the eye of a tornado, as Sifu Ralph mentioned. This is a tough concept to train. I entitled it “Give me a hug”, because I remember a couple of years ago, when training with Si-Hing Steve... he decided to go into that hugging mentality and was able to: 1) disgust me, but more importantly 2) get into my space very easily, leaving tons of chances to finish the deal. Most people have heard of the Bruce Lee quote “Be like water…”. Well, the concept of fluidity came about again. Combat Tai Chi! Many animals use each and every part of their bodies in a synchronized wave when they move. We are animals as well, so why don’t we do the same? Let’s get into that hula hoop action, and get those hips going! When training, performing or applying WT (or posting youtube videos for that matter), don’t make the observers say “Blech!”. That expression of vomiting should be reserved for the opponent when falling down to the ground. Or any other sound effect that happens to come out after being hit. What am I getting at here? Being alive. Intensity (gee… not that again). No dead techniques. We’re not posing for a photo-shoot here. It was awesome to train with Danny and Evan Senior. On Saturday night, we visited Regency Palace again, but this time we sat in one of the smaller rooms. 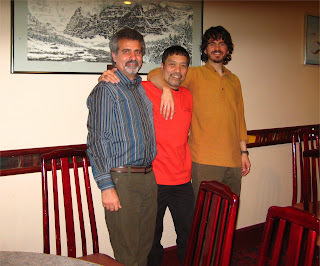 It was nice to chat with Sifu Tony Tam again, about his Fatshan Wing Chun lineage. 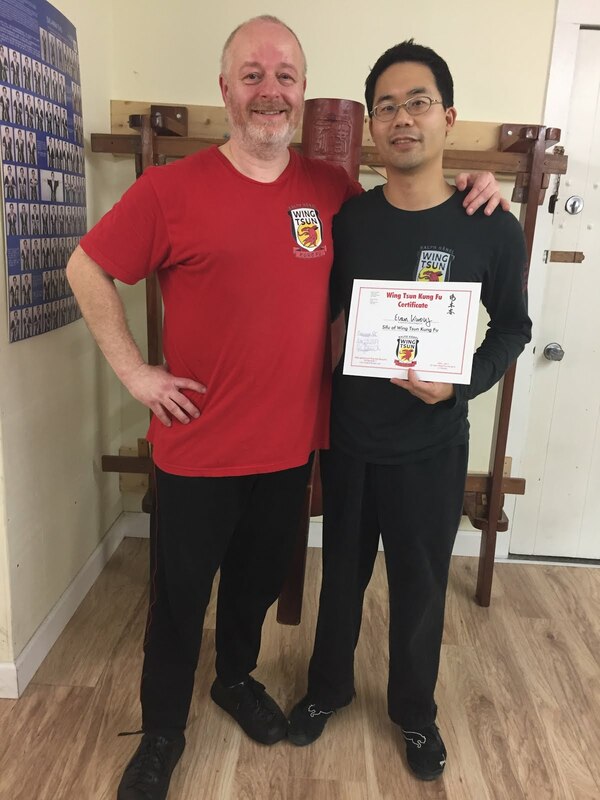 Following dinner, there were presentations by Sifu Ralph, in particular the promotion of Si-Hing/Sifu German to 2nd Technician Grade (congrats!). Plus, a lovely cake baked by Joy. Finally, the students presented a WT banner to Sifu German. One thing though, we forgot to get Adrian and Cory to regail us with memories of the past when Calgary WT first started out in a garage. I don’t know what special ingredient was in that cake, but soon after everyone had a piece each, a lot of laughs were brought out! 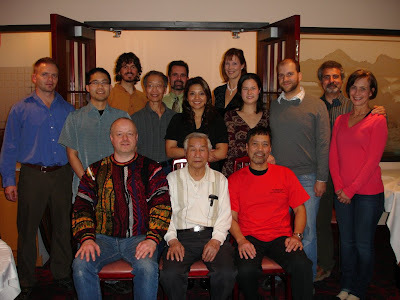 If you can make it, the Wing Tsun Kung Fu Vancouver 15th Anniversary Seminar occurs on November 21st, plus a dinner on December 4th of 2009.
haha, great read. seems like a lot to digest from seminar..and from that cake i suppose. U coming to the vancouver seminar? yeah dude, this seminar had one of those "AHA!" moments. Too bad, I need to go to Edmonton that same day. I'm so jealous, and I have already been reminded about feeling guilty for missing this "once every 15 years" event! Forever student of Wing Tsun Kung Fu since November of 2004. Sifu and 2nd Technician Grade in Hänel-WingTsun. Training history: Wing Tsun Toronto, Wing Tsun Kung Fu Vancouver, and Calgary Wing Tsun. What is Biu-Tze and how do we train it?